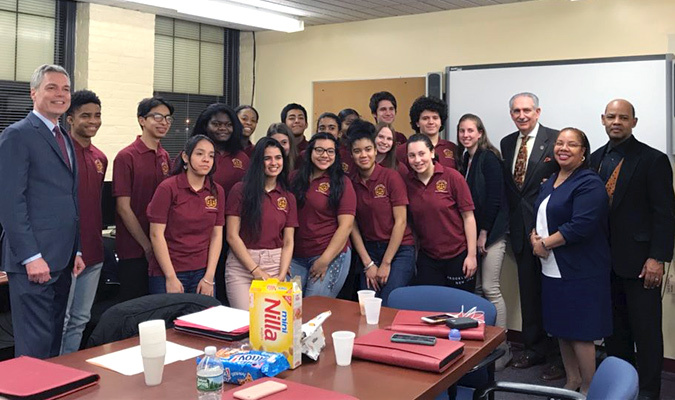 Westchester County District Attorney Anthony A. Scarpino, Jr. recently addressed members of the White Plains Community Youth Court, a juvenile justice leadership program. Established in 2013, the court serves as an alternative to incarceration program in order to divert first time youth offenders from the juvenile justice system. The Youth Court is run in consultation with the Westchester County Department of Probation and the Family Courts. Cases are processed in Youth Court and a jury of youth peers hands down sanctions after a hearing. All court positions -- judge, jury, attorneys, and bailiff -- are filled by trained high school students. Sanctions range from community service to remedial classes and letters of apology. The program accepts youth ages 13-18 for training. DA Scarpino and members of the White Plains Youth Court were joined by White Plains Youth Bureau Executive Director Frank Williams and Youth Court Coordinator Connie Jones-Hairston.